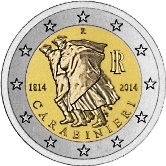 This coin commemorates the 200th anniversary of the founding of the Carabinieri. The Carabinieri were founded in 1814 as an arm of the Piedmontese troops and to-day they remain an approximately 110,000 strong military force policing both military and civilian populations. In the inner circle we see two Carabinieri walking in a storm against the wind. This is based on the 1973 sculpture of Antonio Berti “Pattuglia di Carabinieri nella tormenta” . The image symbolizes a spirit of determination and devotion. At two o’clock is the mark of the issuing country and at twelve o’clock the mint mark. The date of the founding of the Carabinieri and the year of issue appear at nine o’clock and three o’clock respectively. Return from Italian Commemorative 2014 to euro coin collector.